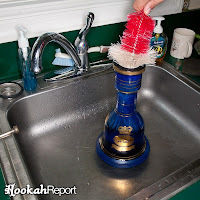 I have a systematic method which i regularly use to clean my shisha. The more often you clean it, the less effort you will have to put into cleaning it. 1. After you have dismantled your hookah i like to start by emptying the water from the base and filling it with a mixture of washing up liquid and boiling water. Leave that to soak throughout the rest of the process. 2. Secondly, clean all the extras in soapy water. This includes: the tobacco bowl, the pipe tray, the tongs, the gumis and leave them to dry throughout the rest of the process. 3. Rinse the main pipe through with hot water under a sink. I use my bathtub as it's the only place my shish fits underneath. Next squirt some washing up liquid down the pipe and start thrusting the pipe cleaner down the shisha pipe. Rinse the pipe and the pipe cleaner and keep repeating until there is no more dirt inside the pipe. You will be able to see by looking through the pipe if there is any dirt left. Rinse it out and stand it up to dry. 4. Now back to the base bowl of the shisha, shake it violently as you empty it. Rinse and repeat. If the stale smell persists in the base of the hookah restart step 1 with something a little stronger than washing up liquid i.e oven cleaner. 5. Rinse and re-rinse the hose as much as possible. But remember this piece needs replacing the most out of the whole shisha. 6. Finally fill your hookah base up with some ice cold water, put your shisha back together, set one up and enjoy a nice CLEAN hit.